We had a great trip to Palm Beach last week, although eating at restaurants all week left me craving New York farm fresh produce to counteract the extensive non-local diet served in hotels and upscale restaurants. I tried to eat local seafood, and enjoyed a delicious tomato but for the most part the food I ate was brought in from far away places north and west of Florida (the main growing season ended in April and the farmers markets don't open again til October). 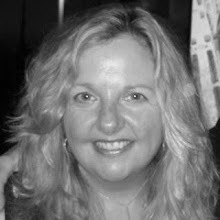 Last night, I made a beautiful and simple dinner for my husband, stepkids and mother including a crisp, tasty salad of mixed lettuce greens and French breakfast radishes with a creative and almost all local dressing, whole black Atlantic sea bass baked in salt, sauteed broccoli rabe and sauteed spinach -- both with a generous amount of garlic. The greens and radishes were from my Chubby Bunny Farms CSA delivery, which on Tuesday included Chinese cabbage, lettuce, radishes, arugala, broccoli rabe, garlic scapes, and spinach plus eggs, strawberries and apples. All the herbs were from my container garden in Southampton. And, the local black sea bass, which I served whole, was purchased from the Clam Man in Southampton. Mix walnut oil, vinegar and honey in a small dish. 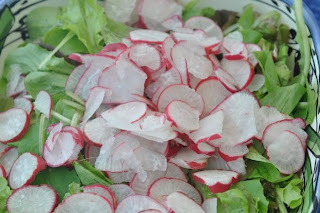 Pour over greens and radishes and toss. The sweetness of the honey adds a nice balance to the spice of the radish. Delicious! 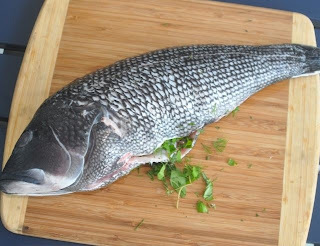 Although an abundance of kosher salt is used to cover the whole fish in the baking pan, the fish does not come out salty rather moist, flaky and delicious with a subtle infusion of fresh herbs. Wash and dry the fish, inside and out and stuff with herbs and butter. Line a 3 inch deep baking dish that is larger than the fish with foil and cover the bottom with 1/2 inch of the salt, and sprinkle water over the bottom layer. Rest the whole fish on top of the salt and pull up the edges of the foil around the fish but not too tight. Cover fish with a generous amount of salt that totally covers the fish. Sprinkle water on top. Use the foil to hold the salt and fish together. Bake in preheated 475 degree oven for 10 minutes per pound of fish, plus an additional 6 minutes. Let the fish rest 12-15 minutes. The fish will continue cooking. Crack the salt crust with a knife very gently and remove the top layer of salt, which should be hard and crusted and lift off easily. Carefully pick up the fish with your hand and a slip a spatula underneath to move it to a plate being careful not to tear the skin which will cause the salt to touch the fish and make it very salty. Once it's on the plate, remove and discard the herbs. If the fish falls apart, carefully separate the fish from the crusted salt and move the fish to a plate. To debone, make a cut along the tail and peel back the top layer of skin and discard. Loosen the top filet in one piece and use a spatula to put on a serving platter. Remove and discard the back bone and any other bone pieces. Place the bottom filet on the serving platter next to the top filet, skin side up, and remove and discard the skin. Broccoli Rabe, also known as Rapini in Italy, is an acquired taste for many as it has a pungent taste -- think turnips. Its tiny yellow flowers are edible. "Broccoli rabe was originally cultivated in the southern Mediterranean. It was brought to the United States in the 1920’s by Italian farmers. Broccoli rabe has been most popular in the Italian and Asian communities for the past several years. "Broccoli rabe looks similar to thin broccoli stalks with small clusters of buds and smooth leaves with sawtooth edges. Broccoli rabe has a somewhat bitter taste and should be cooked to help mellow that taste. It is an excellant source of vitamin C and also contains beta-carotene, fiber, and phytochemicals." we did this last night with a sea bass bought in borough market in london, it was lovely. can we use the salt again? it cost eight pounds!! I"m so happy that the recipe produced a delicious meal. The purpose of the salt is to cover the fish and retain the moisture of the fish during cooking. When the salt pours out of the the box it covers all areas of the fish because it is granular in texture and fills all of air spaces in the pan. Once the salt is cooked with the fish it becomes cast-like hard and loses its granularity in my experience so it would be very difficult to re-create the granularity from a cast to fill the air spaces in the pan. The salt also retains a lot of the moisture and oils from the fish and then becomes something that can possibly go rancid. I suggest that you find a supermarket that sells large boxes of kosher salt at a lower price or a wholesaler perhaps-- specialty grocers /small markets are likely to be more expensive. Bon Appetit! !